On 29th April Lisa and myself were interviewed based on our work [DOUBT and DOUBT 2] covering the Madeleine McCann case. The interview was conducted by an American talk show host podcaster introduced to us by William Ramsey. William is a fellow-author who has covered the West Memphis Three case. When William heard about DOUBT he suggested we do another discussion, and based on a good dialogue on the West Memphis Three case with William, Lisa and I agreed to do it. What we didn't expect was that the discussion would be...well...not with William. The next thing we knew William had brokered an interview with a colleague of his whom he's been affiliated with for the past year. So, would we - should we - go along with it? I'd never heard of Ed Opperman, and neither had Lisa, nor had I heard any of his shows before our interview with him. But he looked legit based on his "private investigator" label, and broadly, he seemed to cover true crime based on his twitter feed. And so, alas, we told William we'd make ourselves available. 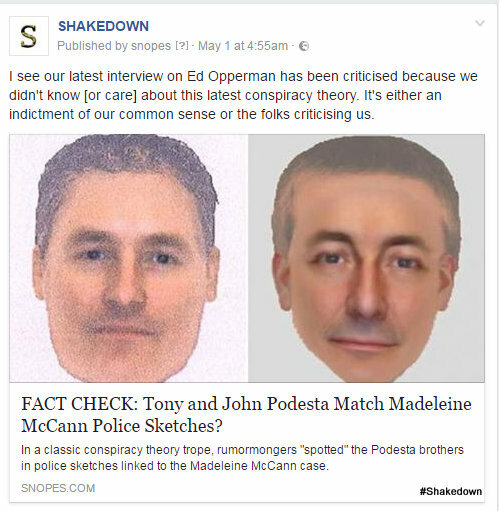 By April 29th, the day of the interview, we had brought out 2 books on the McCann case and were eager to share our insights. During the opening montage of the Opperman show there's a soundbite referring to the discussing of "conspiracy" theories. That was something of an uh-oh moment for both Lisa and myself. In any event, we kept an open mind, and the first hour or so of the show seemed to go fairly well. There was a good conversation on the facts of the case and Opperman himself seemed interested and engaged. During the second half of the show, when Opperman brought up Podesta one can hear a long and uncomfortable silence from both Lisa and myself. We responded to it, but not in a way Opperman seemed satisfied with. Opperman seemed to withdraw into an apparently sulky silence as the show went on. The show actually ends with the end music credits cutting off the interview at the 2 hour mark; that's how disengaged Opperman actually was during the second half. We discovered afterwards that Opperman was engaging with his own listeners on a forum, basically making fun of us while we were on air, when Opperman was supposed to be interviewing us. We were disappointed to see that this was done in a negative and undermining manner. One of the issues he was griping on in the forum was - you guessed it - Podesta. I then engaged with Opperman after the show to try to discuss what had happened, but Opperman remained fixated on the Podesta issue, boomeranging repeatedly back to it, and accusing me of lying - apparently I had pretended to know about it when, according to him I hadn't, or hadn't responded to his question purposely because we were afraid of how this would reflect on our research [in other words, that we didn't know about the Podesta thing]. Again, it's hard to know what Opperman's gripe was - was it that we knew about it or that we didn't? Despite how convincing this still seems to Opperman, neither allegation is true. 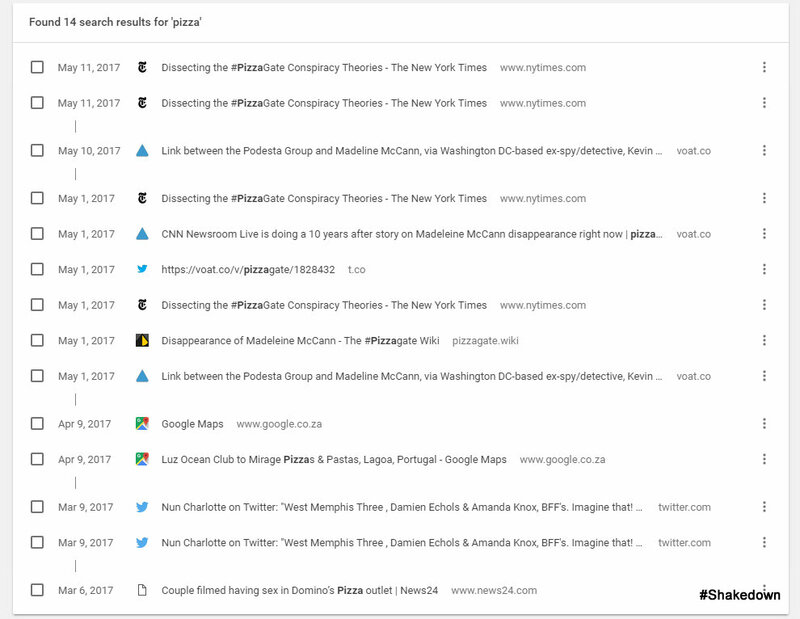 What is true is that both Lisa and myself knew about the efits, we had heard of it during the course of our research into researching and writing two books, and the podesta pizzagate McCann hashtags had naturally floated across my twitter timeline just as I'm sure it had anyone else's who was interested in this case. Neither Lisa nor I paid much attention to them, but that's a far cry from saying we were totally unaware of them. 1. We were invited onto Opperman's show to discuss our research in our books. 2. A large part of the argument here is because Opperman wanted to insist on addressing something that isn't in our books and thus there was very limited use in discussing it - certainly for us. 4. Despite Opperman's conviction of our complete ignorance, both Lisa and I had come across the Podesta conspiracy prior to our discussions with Opperman, we simply paid very little attention to it. On the question whether Opperman is an expert on the podesta conspiracy - you'd have to ask him, and ask him why he is. 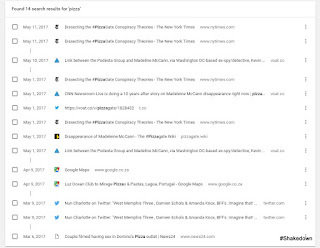 Below are two screengrabs providing my browser history on Podesta - note the first access was prior to the day of the Opperman interview [April 29th]. The second is based on google search term results for pizza references. No serious Madeleine McCann researcher thinks that the Podesta... photos of the Podesta brothers have anything to do with the disappearance of Madeleine McCann. 6. Even after directing Opperman's attention to the bogus nature of the "podesta sighting", Opperman insisted on accusing me of complete ignorance of the Podesta conspiracy. 7. I then questioned his reasons for insisting that we discuss something when Opperman knew - or ought to have known - this was a bogus line of inquiry anyway. 8. Opperman is quite vague on this point: "Yea I'm aware of all that" he wrote in response to my providing him with a New York Times and Snopes article utterly dismissing the connection. In Opperman's vague answer he infers that he knew about Podesta, but not that it was clearly a conspiracy theory. Really? Was Opperman insisting that we discuss something he knew nothing about? 9. This seemed clearly disingenuous from Opperman. 10. This impression was reinforced by his own admission on SKYPE that he had personally worked as a defense investigator in the Pizza Connection Trial and Commission. 11. Opperman's job was to defend his clients from conspiracy theories. 12. Despite this irony, Opperman continued to insist that I had "suddenly" and opportunistically "become an expert" on Podesta but only after Opperman had drawn my attention to it. 13. As a result Opperman felt justified - and continues to feel justified - in posting salacious, humiliating and insulting accusations. 14. 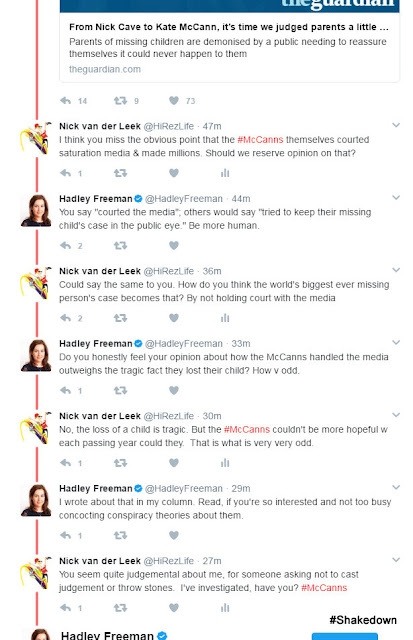 However due to the nature of Opperman's show, and the nature of his private client work on the Pizzagate conspiracy, his accusation seems to be based on a clear conflict of interest, besides not being true or accurate or of real relevance either to our books, our research or the McCann case. 15. Shortly after this discussion a high profile reporter at the Guardian newspaper actually accused me of "concocting conspiracy theories", no doubt influenced by this entire line of inquiry which had occurred just a few days earlier. 16. Another respected reporter whom we were involved in, in an advanced stage-interview, also appeared to see the whole issue as an obscure argument over a disproved conspiracy theory, which torpedoed those discussions. 17. Opperman also went onto twitter to gleefully report "Nick van der Leek is having a meltdown on Youtube." So it is fair to say, thanks to Opperman's efforts, we have suffered some reputational damage, though more so I believe with those who don't know us than those who do. After the first show, there was the issue of the invitation to do a second show. Opperman in fact never once raised the issue of the 2nd interview to me or Lisa, although he did raise it at the end of his show, and in the above comment. To be honest, initially I was prepared to do it provided we could have a proper conversation with Opperman, clear the air and make sure we were on the same page. One suggestion I could have offered, if Opperman had condescended to engage in a normal dialogue, was to open the second interview with Podesta. Opperman could then spend 10-15-20 minutes, however long Opperman wanted to discuss what he wanted on his show, discussing how not relevant the Podesta conspiracy was [or how relevant he thought it was], and hopefully satisfy Opperman and his conspiracy crowd. I'd imagine, in this scenario, Opperman essentially interviewing himself because his expertise/experience appears to be in the Pizzagate aspect of the Podesta conspiracy, which Lisa and I know and care even less about. Nevertheless, if that would have been necessary to make everything better, we may have been willing to consider it. But it became clear very quickly that Opperman wasn't in a conciliatory frame of mind either during his first interview or since. It has been very antagonistic, and in our view, unnecessarily so. I also want to emphasize that both Lisa and I feel equally appalled by what has happened. At one point I suggested Lisa do the 2nd interview alone, but once she saw Opperman's comments [public as well as privately to me], she decided she didn't want to be associated with Opperman either. I have asked Opperman to take down the interview as a gesture of good faith but so far he has refused. The request isn't because Lisa and I are embarrassed about the interview itself, it is because we wish to disassociate ourselves from a sideshow distraction, and dissociate ourselves from Opperman. What we'd prefer instead is the proper and sobre investigation this case - and Madeleine McCann herself - deserves.